I'm not sure how many of us may have noticed the new series pages on Amazon. I saw them and didn't really think much other than "cool, now I can see the whole series at once and read in order easily." Not only that, but it tells you how many of the series you own and how much it would cost you to purchase the remaining books!! My one-click finger is going to love this - my wallet is going to hate this. 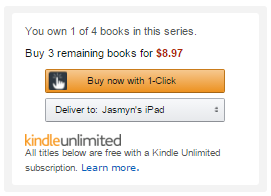 It also tells you if the titles are part of Kindle Unlimited. All the series information on one page - including the price to own all of what has been released is a great thing from both an author and a reader perspective. No more hunting down the reading order or trying to calculate how much it's going to cost you by adding it up book by book. But there's more to them than that. A.L. Kessler pointed out to me last night that you can now leave a series review. This is great!!! Being able to read a review for the entire series is a great way to see if it stays strong through the end, or tapers off somwhere in the middle - all in one place. I am going to go through my completed series (yes, completed only - my personal choice) and start leaving some reviews - I encourage the authors out there to encourage your readers to do the same! And you don't have to wait for the series to finish - that's just how I'm choosing to go about it. What do you think? Are you going to leave some reviews for the series you've read? I'd love to hear what others in the book world from all sides have to say.